(Nanowerk News) Noncovalent bonds formed by electrostatic interactions rather than the sharing of electrons define the structure and function of proteins and other large biological molecules. Such bonds, which include hydrogen bonds and ionic bonds, have also become pivotal in the development of materials at the nanoscale. Kai Wu and colleagues from Peking University and the Zhejiang University of Technology in China have now created two-dimensional molecular porous networks with a systematically adjustable structure using the hierarchical formation of hydrogen bonds ("Two-Dimensional Molecular Porous Networks Formed by Trimesic Acid and 4,4'-Bis(4-pyridyl)biphenyl on Au(111) through Hierarchical Hydrogen Bonds: Structural Systematics and Control of Nanopore Size and Shape"). The creation of molecular assemblies on surfaces by a bottom-up approach is a useful technique for constructing nanoscale materials and devices. 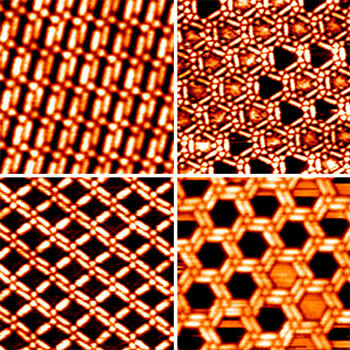 Tuning the geometry of these nanostructures, however, generally involves changing the molecular components, which can lead to unpredictable results. Wu and his colleagues took an alternative approach by using a single set of building blocks — trimesic acid and a multi-ringed bipyridine-like molecule called BPBP — to create a range of architectures simply by adjusting the ratio of block types. "This is just like building different types of houses with the same bricks and tiles," explains Wu. Mimicking noncovalently bound systems found in nature, the researchers exploited hydrogen bonds of various strengths to modify the network geometry. "Strong hydrogen bonds determine the orientations of the assembled structural backbones while weak ones control the rotations of central trimesic acid clusters that are connected to the BPBP molecules," says Wu. The team first deposited trimesic acid on a gold surface to form a chicken-wire structure, then vaporized an equal concentration of BPBP over the top. By altering the relative proportion of the molecular components on the surface and the substrate temperature, they were able to produce a variety of networks (see image), including linear, triangular, diamond and hexagonal pore shapes. "The porous networks can be used as secondary templates to host other guest molecules or ensembles of different shapes," says Wu. He adds that the cavities can serve as micro-reactors for quantitative studies of surface reactions. The team is also investigating ways to insert spin-carrying metallic atoms or ions into the pores to control the spin state of the assemblies. "Such networks could potentially be used in high-density information storage devices," says Wu.